Shop Online for All Your Home Improvement Needs. Discount Pricing on Brand Name Kitchen & Bathroom Products. Same Day Shipping On In Stock Items! Aston Global - Completely Frameless. FREE SHIPPING! MR Direct Apron Front Sinks. Best Price! Your source for discount faucets and sinks including kitchen faucets, bathroom faucets, modern & luxury faucets, roman tub faucets, shower faucets, bathroom sinks, kitchen sinks and bath fixtures. We carry major brands such as Delta Faucet, Grohe, Price Pfister, Remer by Nameeks, Kraus, Anzzi, Ruvati, Elements Of Design, LaToscana, Lenova, Giagni, Kingston Brass, Bio Bidet and many more to suite your every need! We carry over 180 name brands to choose from -- at great discount faucet and sink pricing. We are selling brand new factory sealed products only. Please request a quote about product(s) that you are interested in, but are unable to find via our website. In most cases the product you are looking for will be added to our site within 15-30 minutes so that you can return and order it online. A kitchen faucet should not only be functional, but attractive as well. The are dozens - maybe hundreds - of faucet designs to complement the style of your kitchen. 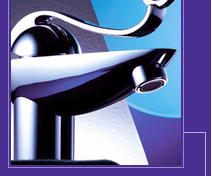 The FaucetLine.com offers a variety of discount faucets for your home. Choose from traditional kitchen faucets like Delta Faucet and Kingston Brass to modern kitchen faucets from manufacturers like LaToscana, Fresca, Pegasus, Nameeks, Ramon Soler, Estora or Sumerain. The sink always been the kitchen's primary workstation, making the choice of bowl (configuration and material) and faucet a highly individual preference. When planning and upgrade, go for tough materials and big scale (deeper, broader bowls, higher-spouted faucets), both of which add up to convenience. The debate over kitchen sink materials centers on three key characteristics: durability, noise-dampening capacity, and ease of maintenance. Copyright © 2003 - 2019 FaucetLine.com. All rights reserved.